Leon van Gasteren from the Netherlands returns with a new trip report on the 2016 German Grand Prix at the Hockenheimring. When I think about F1 in Germany, the first thing that comes to mind are drivers like Michael and Ralf Schumacher, Heinz-Harald Frentzen and Nick Heidfeld, who were some of my heroes when I started watching the sport. The first race I ever went to was the 1997 Grand Prix of Luxembourg at the Nurburgring. This circuit became a favorite of mine, as I went a further four times (1998, 1999, 2000, 2002). The 1999 race, which was won by Johnny Herbert in the Stewart, was a particular highlight. Somehow, I never made it to the Hockenheimring, but it’s been on my bucket list. The great crowds in the motodrome section of the circuit always fascinated me when Schumacher was at his peak. 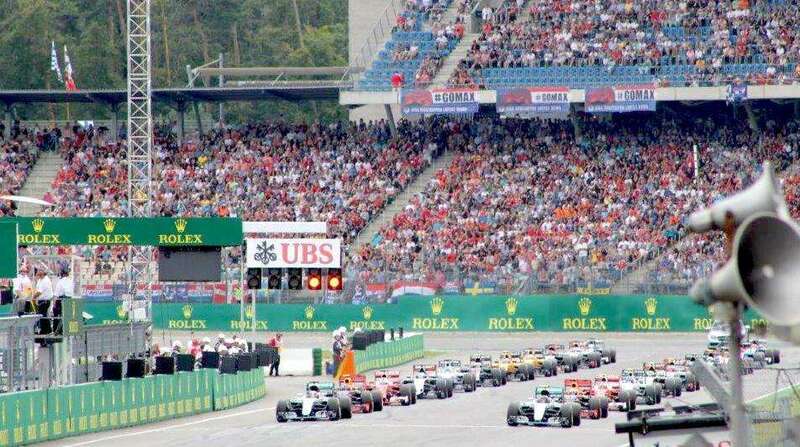 This year, we finally booked a trip to Hockenheim for the German Grand Prix. From the Netherlands it’s just a short car ride (approx. 3-5hrs) to Hockenheim. There are many accommodation options, from camping at the circuit to hotels in nearby cities such as Mannheim, Heidelberg and Darmstadt. After watching the qualifying session on TV at home in the Netherlands, we drove to our hotel in Darmstadt. On Sunday morning we arrived around 8:30am at Hockenheim after a 50-minute car ride. With limited traffic jams we parked our car at P6 (free parking). From there, it was a short 30-minute walk to the circuit. We had bought tickets for grandstand Nord B (cost approx. €235 each), which gave us a view of the first corner and pit-exit. After the GP2, GP3 and Porsche Supercup support races we finally got a glimpse of the F1 drivers during their track parade: the drivers were all driven around in separate classic cars, which I find a lot more fun than when they are all on the back of a truck. After the drivers parade it was time for a quick lunch. Unlike other circuits like Spa Francorchamps and Circuit de Catalunya, this was well organized with quick service and a good choice of meals. After lunch we noticed that the motodrome was already almost full, despite the bad news about ticket sales in the media. This created a great atmosphere in the grandstands during the race. The gates were opened after the race so we attended the podium ceremony with our local here Max Verstappen! A successful trip altogether. Well organized, especially the catering. Grandstands with good views; in the “motodrome” (especially Innertribune and Südtribune) you can see a great part of the track. The circuit has lost some of its character and atmosphere after the 2002 renovations. There are many affordable tickets but the best seats (in the upper part of the grandstands) are still too expensive. The interest in Germany has fallen dramatically in recent years. The atmosphere as in the period 1995-2000 has disappeared. Everyone has his or her own preferences when it comes to selecting a grandstand. To make your decision, use online resources like YouTube, Google maps and f1destinations.com. Here you can find a lot of information about the advantages and disadvantages of the various grandstands. Fans with a smaller budget should visit the race on Friday or Saturday. The tickets are much cheaper and on Friday you can sit on every grandstand. Although the new Hockenheimring doesn’t have the character and atmosphere of circuits like Spa-Francorchamps, Monaco, Silverstone or Monza, it’s still a great track to visit. It’s a well-organized event with lots of great grandstands overlooking large parts of the track. Hopefully the race can secure its future because Germany deserves a Grand Prix. Leon van Gasteren (1981) from the Netherlands is a longtime F1 fan. "The battle between Damon Hill and Michael Schumacher at Suzuka in 1994 got me interested in the sport and ever since I have had F1 fever! I visited my first Grand Prix at the Nurburgring in 1997 and have been a regular F1 traveller since then. I like to share my travel experiences and help others fans organize their F1 travels.